The elite of the Qing dynasty was Manchu, who before taking over China from the Ming lived in the Northeast and were known as Jurchen. For long they lived primarily off hunting and gathering, which made them such good warriors. 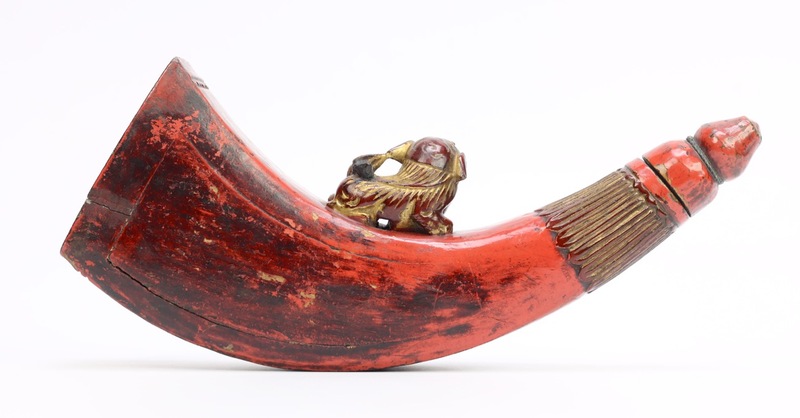 Throughout the Qing, Manchu emperors emphasized the importance of the hunt as a means of upholding traditional Manchu culture and with it, martial prowess. Many large royal hunts were organized, sometimes with thousands of participants sweeping through the forests of Mulan. 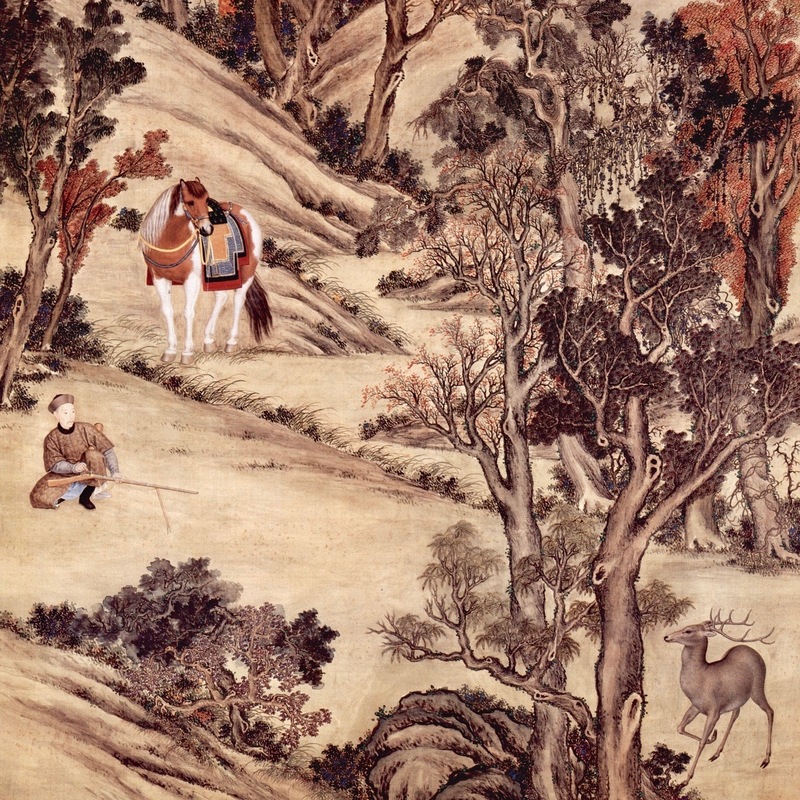 A Qing hunting party on their way to the hunt. Notice the two men on the front, one wearing a large game hunting spear (a.k.a. "tiger spear") and the other a hunting musket. Painting by Giuseppe Castiglione. 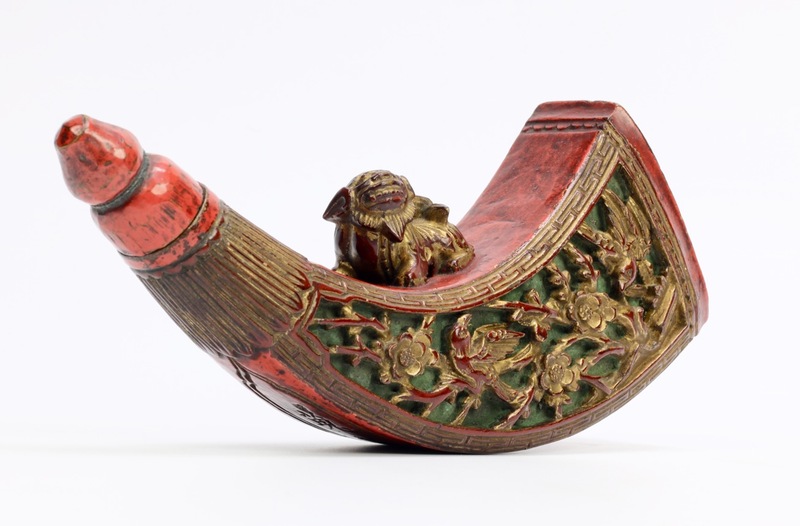 Palace Museum Collection. 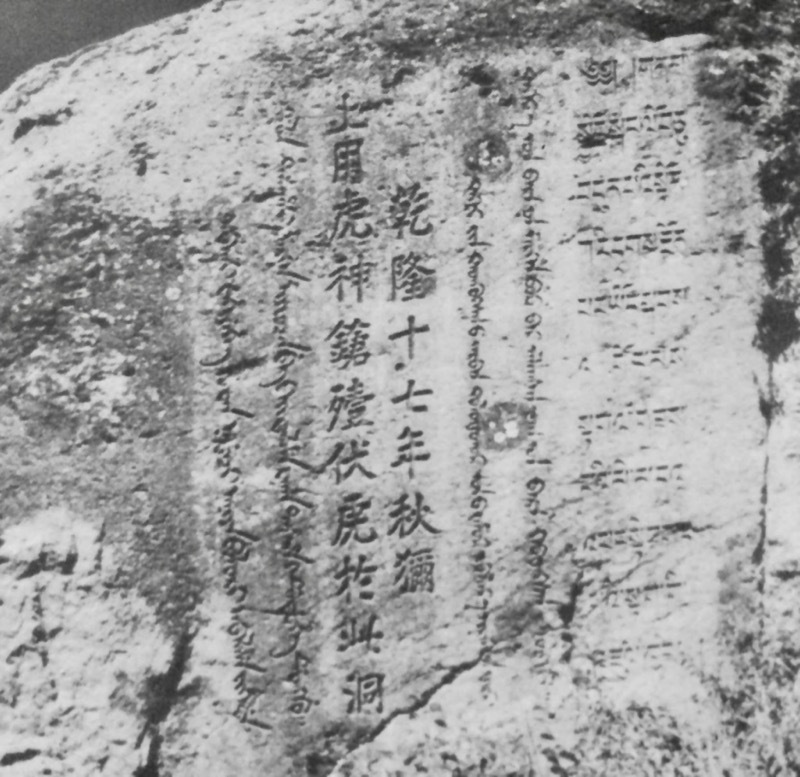 The five-language inscription at the "Resting cave of the killed tiger", commemorating the Qianlong emperor's successful shot in 1752. 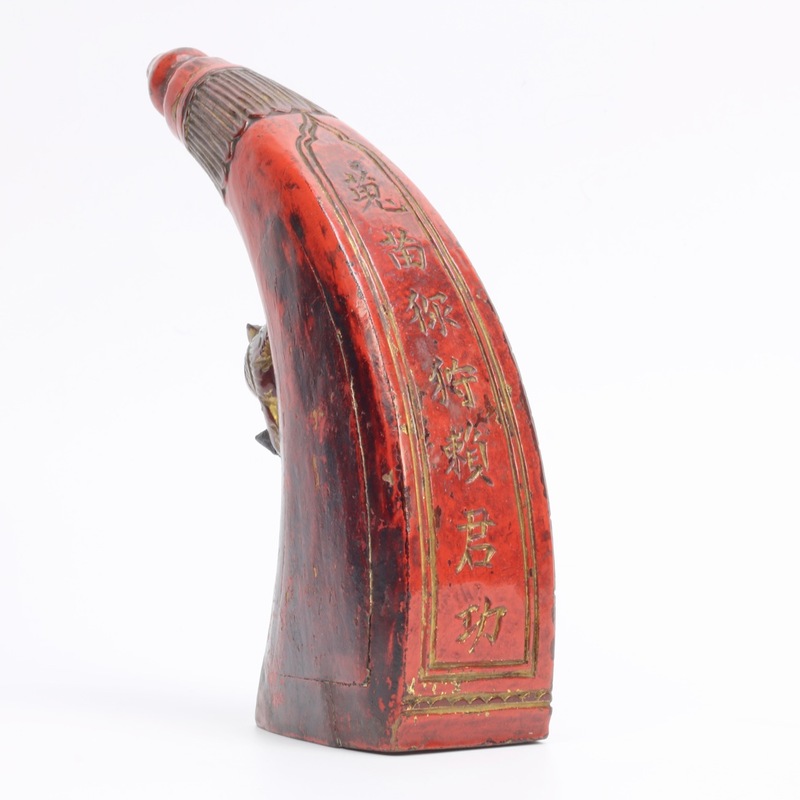 As a result of the popularity of musket hunting among the Qing elite, high quality guns were manufactured for this purpose. This also lead to the manufacture of quality firearms accessories like bullet cases, priming flasks and decorative but functional powder flasks. 1. See www.manc.hu, "Resting cave of the killed tiger". Translation by Fresco Sam-Sin. 2. 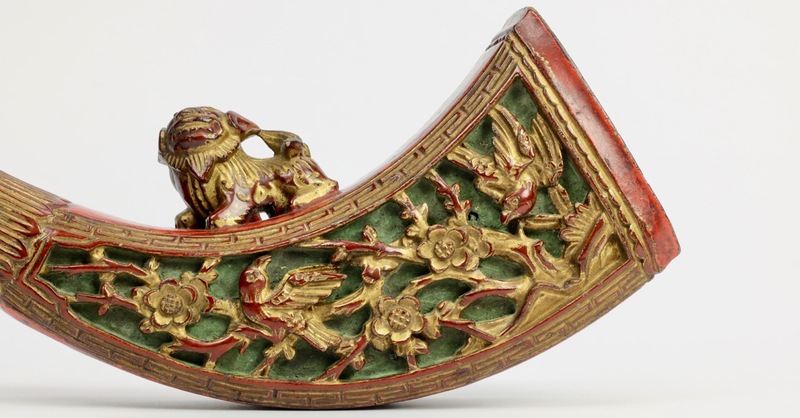 One of Qianlong's own muskets got sold through Sotheby's for nearly 2 million British pounds in 2016. 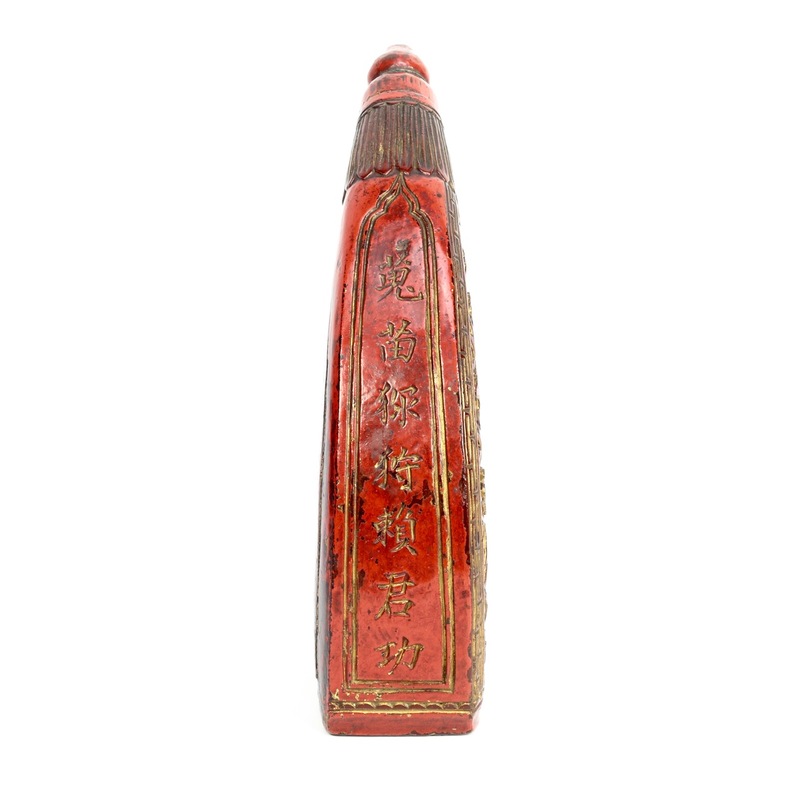 A Chinese lacquered wooden powder flask for a musketeer. 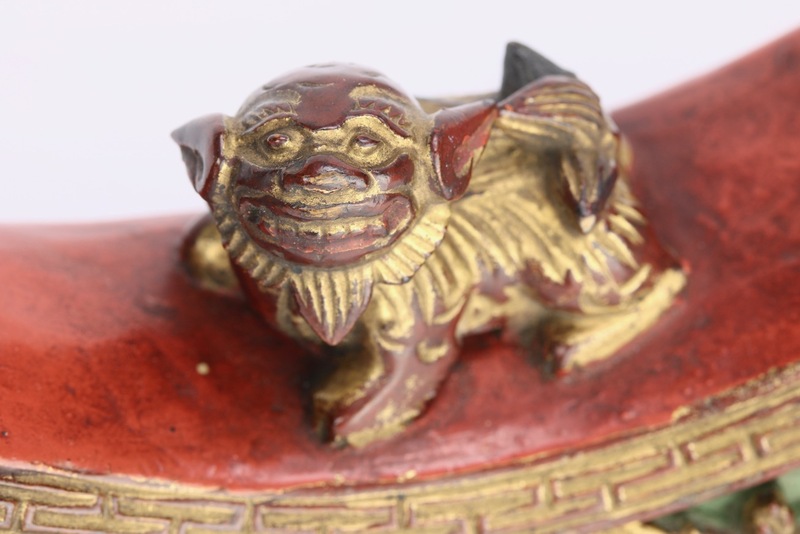 Shaped like a horn, with on top of it a Chinese guardian lion. Such lions, often in stone, are seen guarding the doors of imperial buildings and the houses of officials. One side has an openwork panel with designs of birds on branches with plum blossoms. Because of its hardiness, the plum is a symbol of longevity. Among flowers, it represents winter. Plum blossoms are the first flowers to bloom each year, when it is still too cold for other plants to come to bloom. As such it is associated with perseverance and producing beauty and purity amidst adverse circumstances: The qualities of the true gentleman. Two birds sit on the branches of the plum tree, their hooked bills suggest they may be magpies. Considered lucky birds in China, the Magpie has a special place in Manchu culture. 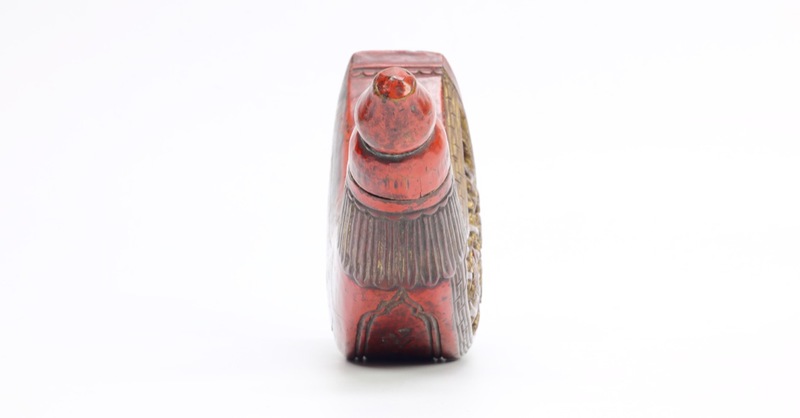 It is the totem animal of the Manchu imperial clan, Aisin Gioro, to which all emperors belonged. The overall design is very pleasing, when viewed from the side you almost get a sense of motion through the way the plum branches are shaped. Through the openings a green background is exposed. The whole is lacquered vermillion, with golden accents. 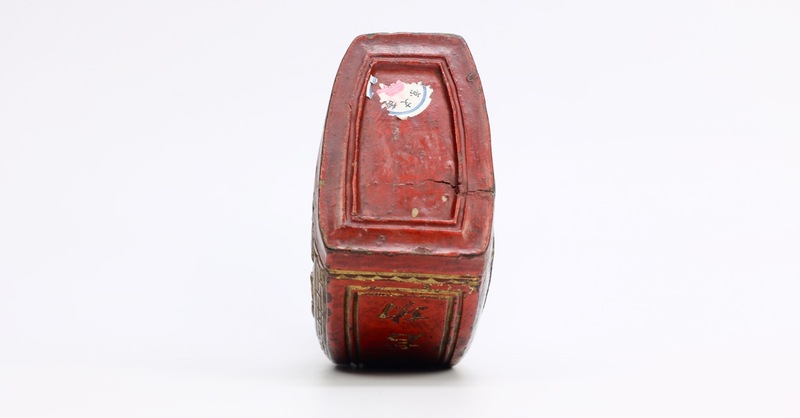 It bears an inscription on one side: 蒐 苗 [X] 狩 賴 君 功. One character is unintelligible to me, but it seems to say something in the lines of: "Hunting in the spring and summer, [X] the result relies on effort." A reference that seems to imply a successful hunt is in one's own hands, rather than being merely the result of luck. 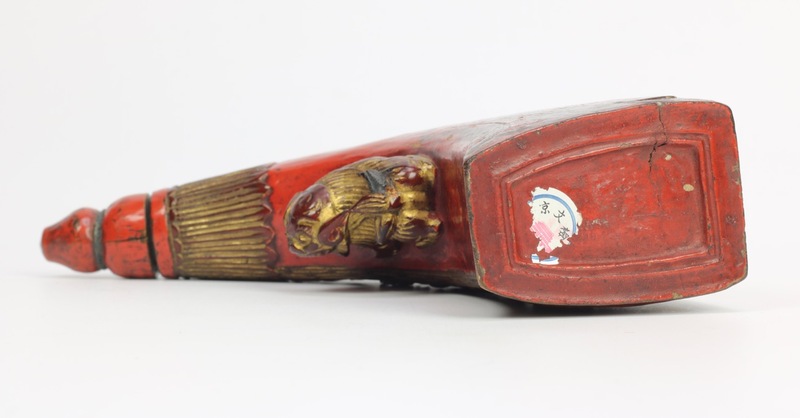 At the back there is a sticker that is often found on Chinese antiques that were bought in China in the late 20th century. Possibly, of the Friendship Store. It is easy to remove but I decided to leave it on for now, as it's part of its history and gives a hint of provenance. 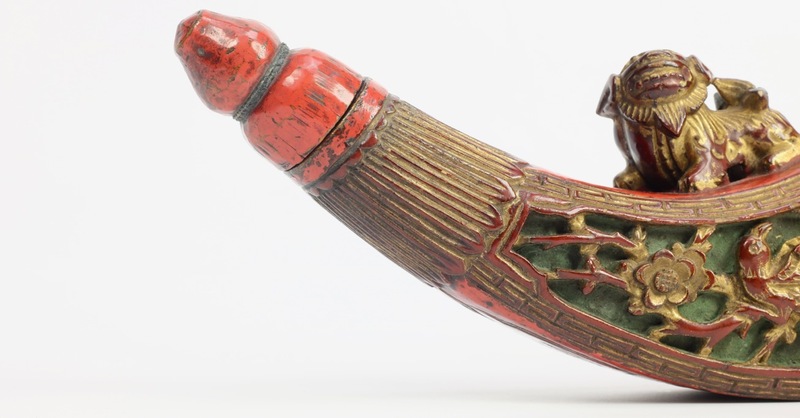 It has a bamboo, lotus bud-shaped stop that was lacquered in the same color as the flask itself. The opening still smells strongly like gunpowder. 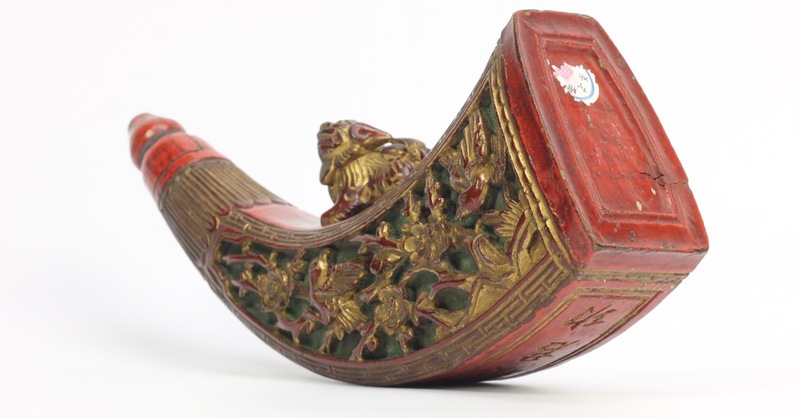 While muskets of the rank and file are still found on the market from time to time, firearms and accessories belonging to the Qing elite are very rare. 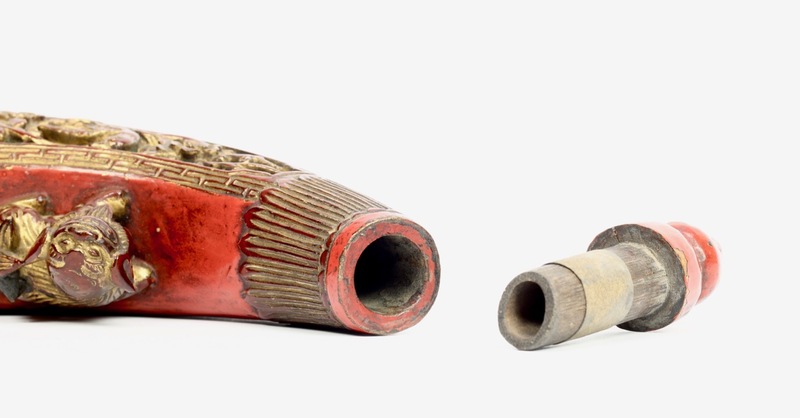 This powder horn is a very well-preserved example that apart from its aesthetic appeal tells a story about its original owner. 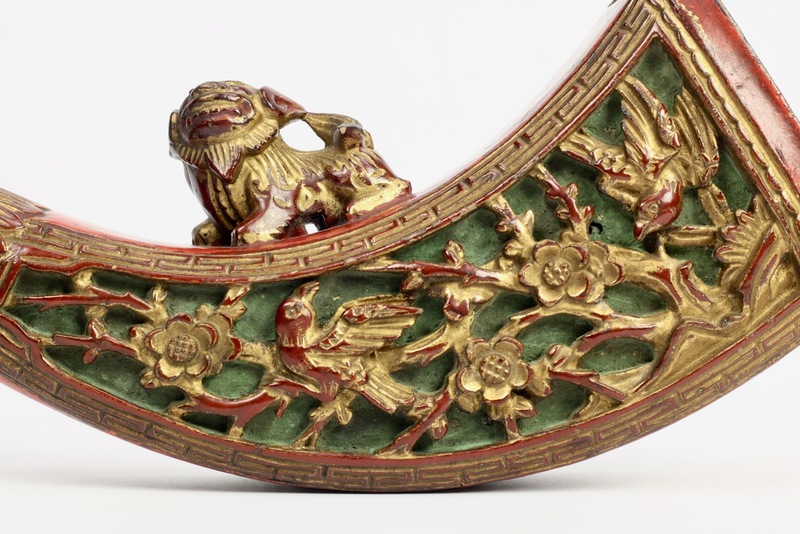 The Qianlong emperor preparing his musket in anticipation of shooting a deer. Painting by Giuseppe Castiglione. 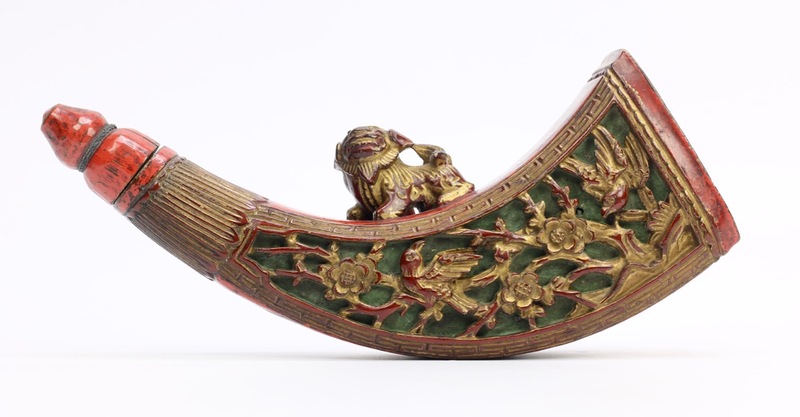 Palace Museum Collection.